Built for directional outdoor wireless networking, the NanoBridge M9 bridge antenna can connect very distant networks with full 802.11n speeds. 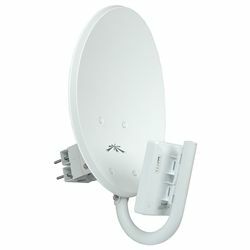 Conveniently built into a lightweight but high-gain 17-inch dish, the bridge's powerful router is easy to install and includes pre-installed AirMax TDMA software, enabling scalable, carrier-class point-to-multipoint network performance. Completely weatherproof, the NanoBridge M only requires a single CAT5e/6 network cable to be plugged into it... no need to bother with finicky coax connectors. Includes pole mount kit, Power-over-Ethernet injector and AC adapter. Requires network cable and mounting pole, not included. Note: Use in pairs for maximum point-to-point throughput. Operation may not be legal in all jurisdictions. 33 out of 33 find this review helpful.